SEATTLE - Jun. 12, 2014 - Amazon Prime is one of the most popular subscription services, with tens of millions of members. Prime members already enjoy unlimited Free Two-Day Shipping on more than 20 million items, unlimited streaming of tens of thousands of popular movies and TV episodes through Prime Instant Video and access to more than 500,000 books to borrow for free with the Kindle Owners’ Lending Library. 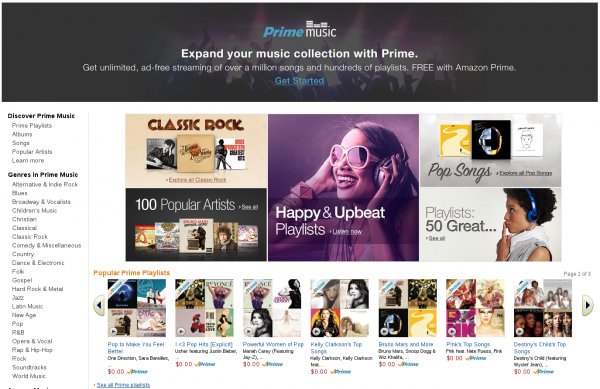 Now, Amazon Prime is getting even better—introducing Prime Music. You be the DJ or let us be the DJ—it’s your choice: Build the perfect playlist by choosing songs you already love or songs you just discovered through Amazon’s personalized recommendations. Or, just sit back and listen to one of our hundreds of Prime Playlists designed for all types of genres, occasions, artists, moods and activities, like “Feel Good Country,” “Bad Boy Rock,” “Beards & Baristas: Indie Beats,” “Hip-Hop Workout,” “'90s One-Hit Wonders,” and many others. Prime members in the U.S. can start listening to Prime Music today at www.primemusic.com. Kindle Fire HD/HDX devices will get Prime Music in an automatic, over-the-air update. Customers can also download the latest Amazon Music app in the Android and iOS app stores. Eligible customers who are not already Prime members can try Prime Music with a 30-day free trial of Amazon Prime by visiting www.amazon.com/prime.